For more of this week’s photo challenge, wall, check out The Daily Post. Last month, I visited one of my favorite book stores, Gingles Books and Baubles. It had been awhile since I’ve been there and I had stopped to search for a few books for a couple of classes. When I arrived, I noticed a huge, beautiful wall mural, covering the entire wall of the building (old Bell building) across the street from the book store (South Street). 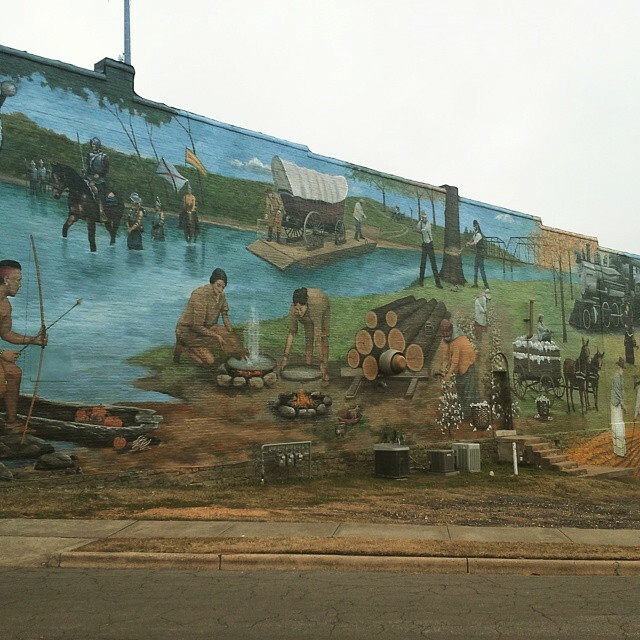 I walked over towards it and noticed that it’s actually a painting of the history of Arkansas and quite possible, some of it depicted history in the town of Benton (Niloak pottery). Spanish conquistador, Hernando de Soto traveled through Arkansas in 1541-42, when he had encountered the Quapaws, in the city known today as Parkin. For more information on de Soto’s travels through Arkansas, click here. 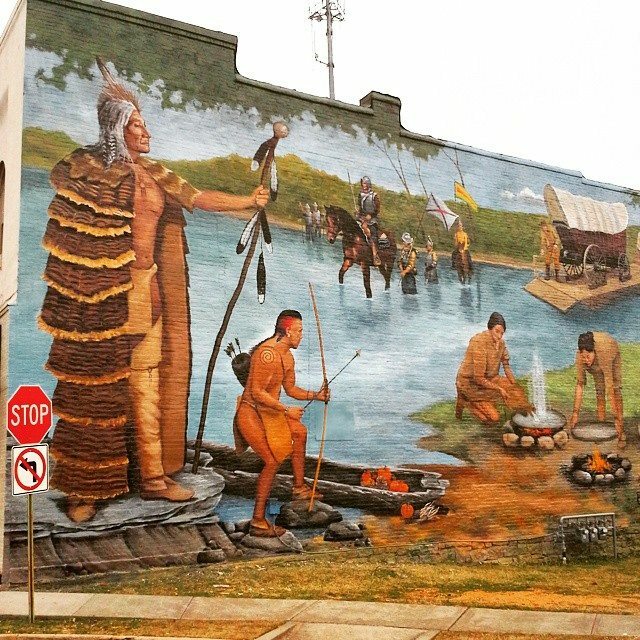 *Please note, the tribe depicted in the mural is Caddo. In Alvar Nunez Cabeza de Vaca’s book Castaways, he was the first Spaniard to encounter the Caddos. Hernando de Soto died in May 1942, having never met with the Caddos. It was his successor, Luis Moscoso de Alvarado, who after de Soto’s death, followed along the Red River, into Southwest Arkansas, where the Caddo tribe flourished. For more info on the remainder of the de Soto expedition, click here. Arkansas is also known for it’s timbers and timber mills, as well as it’s diamonds in Murfreesboro, and bauxite ore found in Bauxite. Arkansas had a hand in helping the US military during both WWI and WWII. Aluminum comes from bauxite ore and the town of Bauxite has an abundance of it. Arkansas was also known for its pottery called Niloak, which is kaolin spelled backwards. Kaolin is the type of find grade clay found here in Benton, Arkansas. It was popular in 1909 to 1946. Niloak had a hard time making it through the depression, but it was successful during WWII when they produced over a million clay pigeons for the military. After the war, the company hit another downfall and it sadly went out of business. The mural artwork was done by Dianne Roberts, who was hired by the Gann Museum to paint the mural. You can check out their FB pages by clicking on their names and see pictures she used to help her create her beautiful mural. Sadly, Books and Baubles will be closing it’s doors for good in April, unless a new owner can step forward and keep it open. Click here, for more information. This entry was posted in Blog, History and tagged aluminum, anthropology, Arkansas, Arkansas History, Arkansas Indian tribes, Arkansas Native Americans, Arkansas pottery, art, artwork, author, Author Jennifer Adams, author Jennifer N Adams, authors, Bauxite Arkansas, bauxite ore, Bell building, Benton Arkansas, Benton history, blog, blogging, books, Books and Baubles, Bryant Arkansas, Caddo, Caddo indians, Casa de Vaca, Castaways, clay, clay pottery, college, college student, college students, Crater of Diamonds State Park, creative writing, cultural anthropology, culture, De Soto, de Soto expedition, Diamond State Park, diamonds, Dianne Roberts, gann museum, Gingles Books and Baubles, Hernando de Soto, indians, kaolin clay, Little Rock, murals, Murfreesboro, Native Americans, niloak, Niloak clay pottery, niloak pottery, non fiction, paintings, parkin, parkin arkansas, photo-challenge, photography, pottery, published, published author, publishing, Quapaws, school, South Street Benton, Spanish conquistadors, Spanish history, timber mills, Weekly Photo Challenge, World War I, World War II on March 15, 2015 by JenniferNAdams. 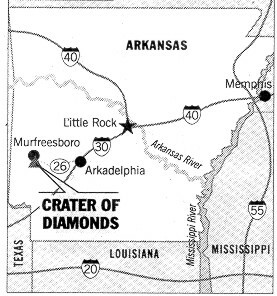 There is a small town in the Southwestern corner of Arkansas, called Murfreesboro where you can dig for diamonds, for a small price, and keep what you find. It’s the 8th largest diamond mine in the world, but it’s the only diamond mine open to the public. Crater of Diamonds became a State Park in the mid 1970’s. Since then people have been finding diamonds of many sizes; at least two diamonds a day can be found. This Spring Break, I took a few friends to hunt for diamonds. It was their first time and my second time. Though we found many color rocks, such as Jasper, quartz, and calcite, but no diamonds. The park has a desk, made specific to help you go through your finds and tell you what each rock is and if you have found a diamond or not. 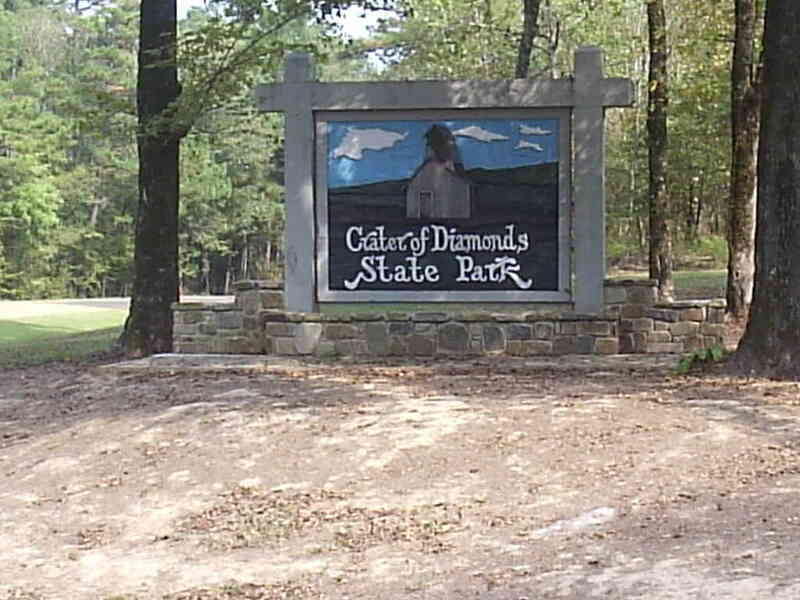 They also have a museum to help you distinguish what the diamonds look like there at the Crater of Diamonds State Park. The digging areas are marked where all of the diamonds have been found, and a bulletin board showing how many diamonds were found on what day and how big the were; this bulletin board is updated daily. You can rent sifting screens, shovels, and buckets or you can bring your own. 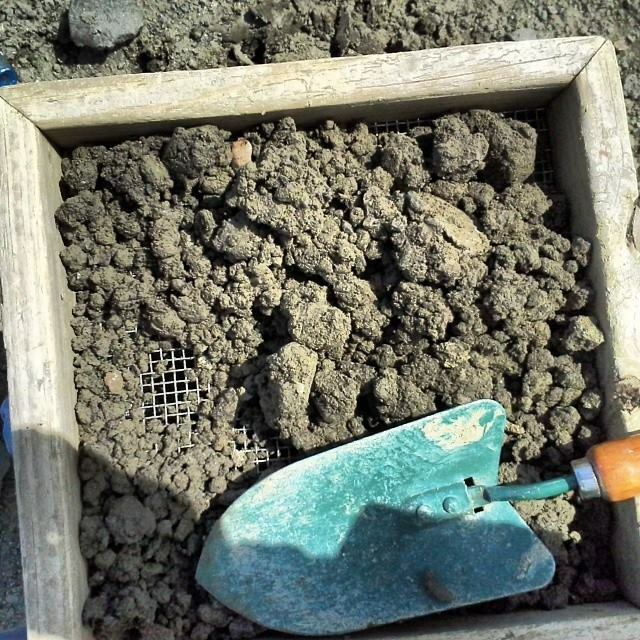 They have water tubs,that make sifting through some of the tougher clay, much easier. It also helps the shiny rocks become more noticeable. Even though the only shiny rocks I found were quartz crystal and calcite, I still enjoyed myself and didn’t mind get dirty. I’m hoping to make another trip in May with my youngest sister when she comes up from Georgia to visit. Note: Even though they say they plow the 37 1/2 acres weekly or daily, the best time to go digging for diamonds is right after it rains. This allows some of the sediments to wash away and help the diamonds become more noticeable. The best clothes to wear for digging diamonds are, a pair of boots (trust me on this one) and a pair of jeans and a tee that you don’t mind getting dirty. You can bring a sack lunch, umbrella, and a lawn chair out on the field with you and they are pet friendly (I’ve seen many dogs out there having a great time). For more information about the park, prices, location, etc. visit their website. This entry was posted in Blog, Blogging from A to Z challenge, History, Travel and tagged Arkansas, Arkansas diamonds, Arkansas History, Arkansas State Parks, Arkansas tourism, blogging, Blogging from A to Z Challenge, Crater of Diamonds State Park, diamond mining, diamonds, diamonds found in Arkansas, family, Found in Arkansas, Murfreesboro, State Parks, things to do in Arkansas on April 4, 2014 by JenniferNAdams.